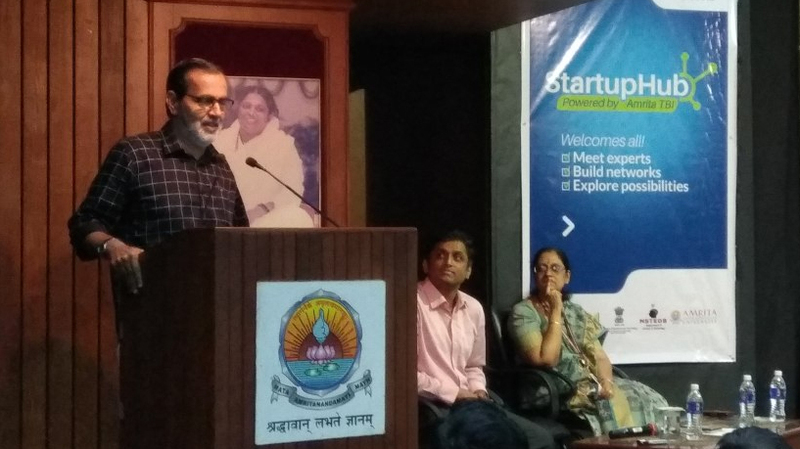 The first edition of Amrita TBI startup hub aimed at building a strong entrepreneurial framework was conducted at the largest urban agglomeration at Amrita Vishwa Vidyapeetham’s, Kochi Campus. It gathered momentum as a networking event on 23 Sep 2017 when the chief guest of the event Shri Kochouseph Chittilappilly, Founder, Chairman, and CEO of V-Guard Industries delivered the keynote address. The versatile event brought together a diverse group of experts with similar ideologies and also included budding entrepreneurs and students. The startup event proved to be a platform to get first-hand information from successful business owners and startups to take their idea to the next level. “When I started my business it was slow but there was a steady increase in it.If I had to expand my business I had to improve myself. I am a technical person but acquired skills required to grow a business”, added Chittilappilly. The event is powered by Amrita TBI and NITI-Aayog. Amrita TBI is a non-profit startup incubator supported by Govt. of India and Amrita Vishwa Vidyapeetham (Deemed to b University) which fund, mentor and nurture ideas, startups, and entrepreneurs. In 2017, Amrita TBI received the National Award for being the Best Technology Business Incubator in the country.